Looking for the best baby swing for your newborn? Introducing the Sansa from Joie. A well-designed, multi-functional 2-1 musical and motion lounger for babies from birth to 9kg (20lbs infants approx. 6 months old). Sansa will both soothe and entertain your little one! Are you hesitating to buy what my partner used to deem a ‘robotic nanny’? We wondered if the cost was worth it, thinking it an unnecessary purchase, lured into a false sense of security by our firstborn. Then arrived Norah, and with her came colic and reflux, resulting in a very demanding and fussy baby. The Sansa is one of the best baby products I have chosen in my seven years on the parenting circuit. EVERYTIME my daughter goes in the lounger she stops crying and seems relaxed, often falling asleep. I was worried that with her reflux it may make her sick if the movement was unnatural, but it doesn’t. How does a baby swing help with colic? The gentle motion provides physical relief, offering contentment for unsettled babies. 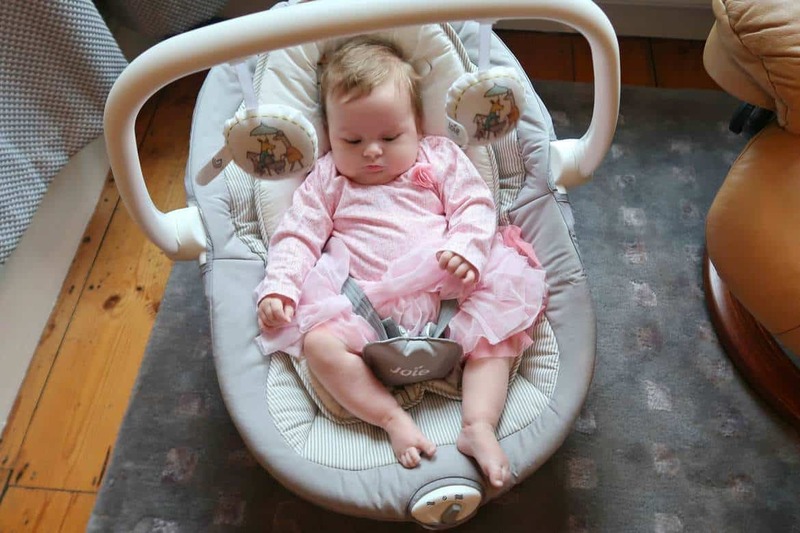 The Sansa’s two speed gentle vibration mechanism built into the chair can be soothing to infants, calming the colicky baby or lulling an overtired little one to sleep. It is battery operated so that when separate from the base the chair is easily movable from room to room. You simply need one D battery which is much more economical than products that use a multitude of AA’s! Note: the battery compartment has a simple clip release that you access with a screwdriver. You do not need to unscrew anything. A rock stop foot flips down to halt rocking motion so the Sansa can be stationary, or it can be a manual rocker when not being used as a swing. Simplicity at it best. Most basic baby swings will move back and forward. The Sansa movies in multiple directions; back and forth, gliding side to side or combining both to mimic the rocking of a parent’s arms. Your baby may prefer a faster or slower swing. The seat turns 90 degrees on the frame to change the direction of all motions. Having multiple setting options to choose from means there will be a perfect swing speed to settle baby if your little one is a bit sensitive. Note: Unlike frame top hinge swings It would be very difficult to knock the Sansa over. The fixed floor base makes it sturdy and a safe choice for parents. The base runs on AC power which is more economical than burning through batteries. We love modular designs as they mean you get value for money through lots of use! The Sansa can play five classical lullabies and five additional nature sounds including white noise options which are well known for calming babies and regulating their breathing and heart rate. No need to buy expensive sleep aids! Perfect for calming a newborn the volume is adjustable if it gets too stimulating, and the speakers have impressively clear sound. Your baby will appreciate different position changes. Some babies may like a flat position whilst others like to be more upright. The Sansa is designed for young babies who can’t sit unassisted and provides hands-free time for the parents. Most swings have a semi recline, but this one has three positions, one being seated to straighten your baby’s back, which is great if they suffer from reflux too. A soft padded seat will not only make your baby more comfortable but also help to soothe them. The Sansa has a cocoon shaped seat that reminds your newborn of being in the womb. For ultimate comfort its additional inserts support your baby’s head until they develop their neck muscles. For practicality the body inserts are machine washable and the SoftTouch 5-point safety harness with lower buckle cover (to avoid any accidental thigh pinches) ensures that baby is secure. When buying a baby swing there is one quality that is very important to me. The Sansa has a simple instruction manual and was built in five minutes with a simple locking mechanism and poppers for the seat. It can be easily dismantled for flat storage and cleaning. Perfect for taking with you to the grandparents or to visit friends the independent chair lifts easily off the lightweight base. Additionally, the movable position play bar (with two plush toys) entertains little eyes and acts as a useful carry handle for when moving the seat for easily portability. Note: the toys could hang down to be better positioned in the babies eye line but alternatively there is plenty of space to hang other toys! When you are sleep deprived do you want to be figuring out how to work with apps or LCD screens? The gently lit buttons are simple to operate and are easily accessible. Note: Some swings have timers which stop the movement automatically after a certain period. A previous swing we had would stop after ten minutes which I found frustrating as just as the baby would settle it would stop and startle him. If you baby does drop off in the swing you can leave them to nap for up to 20 minutes and recline into a flat position. Never leave baby in an upright potion as it can restrict their airways. We also consider how easy it is to get baby in and out of the swing. A feature the Sansa doesn’t have is a seat lock, so it doesn’t move around when you’re trying to work the adjustable harness. That said as it is not on a swing frame there is minimal movement. So, do we recommend buying the Joie Sansa 2in1? Absolutely. Swings are a great for parents to catch up with housework or to have a break from feeding or holding baby. This is important if you need to find time for older siblings or have a colicky baby. Overall, the Sansa is a great modern looking baby swing where you get a lot of features for your money. There are no pesky pricey extra buys. The stylish ‘In The Rain’ design’ is perfectly sweet with a gorgeous child friendly but not childish appearance. Sansa’s small footprint frame means that given it is essentially three baby products in one-a lounger, rocker and swing it is compact and a wonderful choice when space is limited. Basically, the Sansa has it all! We absolutely love the Joie products; do you have any for your baby? Have you tried a swing, or do you have a colicky newborn that won’t settle? Disclaimer: This item was gifted to use for this review. All opinions and thoughts are our own. P.s It has no affiliation to Game Of Thrones.